I like to eat this when the plums are warm, and I sometimes have it with a slice of pandoro or panettone. If the season is right, you can use peaches or nectarines instead of plums. Save any leftover amaretti crumbs to sprinkle over ice cream. Prep the plums: Cut through the plums all the way around through to the pit. Hold the plum in your palm and twist the other half away so that it comes off smoothly. Sit the plums cut side up in a baking dish. Remove the pits with a teaspoon, twisting the teaspoon a little deeper than the natural cavity to make it a bit bigger and letting any juice drizzle into the baking dish. Assemble the plums: Crush the amaretti cookies into coarse crumbs. 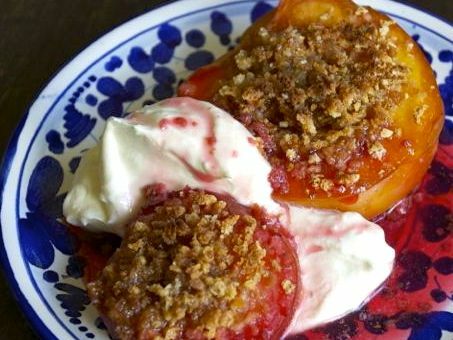 Spoon a heap of amaretti crumbs over the plums, so they settle into the cavities and over the tops (keep any left over). Dot a little butter over each plum top and scatter with sugar. Scatter the rest of the sugar and butter around the plums with the vin santo. Cook the plums: Bake for 15 minutes, or until the liquid starts to get a bit of a caramel look, then add about ⅓ cup hot water around the plums. Bake for another 15 minutes or so, until the tops are golden and crusty and the plums are soft but still in shape. Remove from the oven. Make the mascarpone cream: Whip the cream, mascarpone, sugar, and vanilla together until smooth and beautifully thick. Serve the plums: Serve a plum half with a good spoonful of mascarpone cream and any pan juices drizzled over the top.